Ambrose Young was beautiful. The kind of beautiful that graced the covers of romance novels, and Fern Taylor would know. She'd been reading them since she was thirteen. But maybe because he was so beautiful he was never someone Fern thought she could have...until he wasn't beautiful anymore. Making Faces was beautifully lyrical and truly unique. While it took me a few chapters to connect to the story, since it’s written in 3rd person, I was so happy when everything clicked into place. The characters who took you on their journey were multifaceted and fascinating. And the flashbacks that were sprinkled throughout the story, helped craft a full picture of their history and what they meant to one another. This book was heavily character driven, with a touch of Beauty and the Beast, and it left me looking forward to discovering the rest of her books! “Why do terrible things happen to such good people?” Ambrose asked. Starting out you meet Fern, Bailey, Rita and Ambrose. While there’s many more characters I adored, those were my top ones. They’ve started their final year in high school, and will soon be finding their place in the world. But by that second chapter, I didn’t realize that I was stepping back into 9/11. My own memories slammed into me like a cold sheet of ice. The terror I had for my fellow citizens, and the terror I had for one of my good friends who worked next to the towers, hit me just as hard today as it did years ago. So watching the horrifying events take place put tears in my eyes and a sense of dead in my heart for what would unfold. “She lost her son, Fern,” Ambrose said softly. His own anger dissipated as he spoke the simple truth. He took the towel from Fern’s hands and used it on her hair, wrapping and squeezing, absorbing the moisture, the way he used to do on his own. She stilled, obviously not used to a man’s hands in her hair. He continued his ministrations, and she sat quietly, her head lolling to the side, letting him. Ambrose ended up enlisting in the military, to support his country, along with four of his best friends. And their little tiny town was shocked to the core. Ambrose, from his wrestling career, already had a full ride scholarships to college. Yet none of them took the path that was expected of them. But I’m getting ahead of myself, I have to explain how they’re all connected. Ambrose’s wrestling coach was Bailey’s dad and Fern’s Uncle. And I loved how the team saw Bailey as one of them, how Ambrose stood up and protected him. Because while Bailey attended meets, offered advice, and tracked their statistics, he couldn’t participate in the actual sport since he had Muscular Dystrophy and was in a wheelchair. “Do you think there’s any way someone like Ambrose could fall in love with someone like me?” Fern caught Bailey’s gaze in the mirror again, knowing he would understand. Fern, Bailey’s cousin, had been in love with Ambrose since she was a little girl, yet she never acted on it. He’s this beautiful, muscular God in her eyes, and she’s very plain with her pale skin, thick glasses, a stick thin body and red hair. Yet while that may describe how they looked on the outside, it doesn’t even a shine a light on who they were on the inside. Fern was a caring, compassionate girl who loved and took care of her cousin, Bailey, so fiercely that it was powerful. Their friendship was one of the most beautiful relationships I’ve ever read about. And the other friendships in this book were beautiful too. It made for such a strong theme. And while I watched the past and the present unfold into a beautiful story of friendship, hardships, school and war, we then moved ahead. To when Ambrose came back from war, alone. And Making Faces took on a Beauty and the Beast element, that I loved! Ambrose and Fern’s positions have flipped, yet their shaky friendship was still there. While Ambrose wanted to hide from the world, Fern was determined to get close to him. So watching Fern and her tenacious will was captivating, while watching Ambrose as he suffered, was heartbreaking. I did have a few hiccups throughout the story though. There was a strong religious theme, and I struggled with Ambrose not suffering more from losing his friends and from the horrific situation he was in at war. And lastly, Ambrose’s speech, at a certain event near the end of the book, felt off to me. It was too much about him, and that felt wrong. But regardless, I definitely recommend this book to people who are looking for something out of the ordinary, and who want to meet characters that you won’t find in every other book. 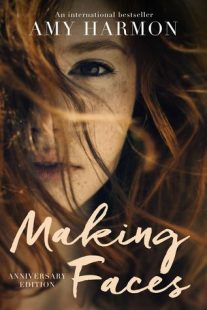 Making Faces is also for people who want a story line that takes risks and shows the uglier side of life, whether it’s bullying, domestic abuse or even just the struggle of accepting who you are. While not everyone got their happily ever after, my heart was still happy with how the majority of theirs lives closed in those last few pages. And as an epilogue junkie, that ending was perfect! PS Towards the end, there was a little touch of a spiritual or some could even say paranormal element (depending upon your view point on life), that I loved too. This was the first book I’ve read that made me cry, I read it about three years ago. I think part of why this book got to me so much was I was also in High School when 9/11 happened, I think I was a Freshman or a Sophomore at the time. I read one negative review of this book that seemed to focus too much on the cliche parts of the book (there were a couple cliche themes), and they didn’t seem to really notice all the great things in this book, like the friendship between Bailey and the Wrestling team, or Bailey and Fern. I love this book. It is just wonderful. I know exactly what you mean, being pulled back into our memories from 9/11 and completely understanding how they all felt was beyond gut-wrenching. And personally I don’t care if books are cliche (so I always look past that in reviews lol), what I care about is if the characters are deep and engaging, if the story makes me become lost in the pages etc. ♥ Oh my gosh, yes! The friendships in this story were all consuming and absolutely beautiful to watch. I can’t wait to discover the rest of her books now! Wow, this sounds like a really powerful one. Anything to do with 911 has the potential to pack a serious emotional punch. That first quote is fantastic! And I’m so glad to hear that you enjoyed the characters and friendships in this one! That’s why I usually try and avoid books about 9/11, but I’m so glad I gave this one a try. It was worth it and it didn’t consume too much of the story, yay. Me too, thanks!